Fully configurable via the easy-to-navigate front panel menus, the CM30 can be commissioned rapidly and then tuned via the advanced autotune capability. Other models are also available within this range. 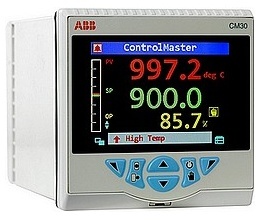 View more details of the ABB CM30 - 1/4 DIN Universal Process Controller range. Other models might not be available from stock, please contact us for price and lead time.